1860 photo taken 4 days after Mr. Lincoln visited Lincoln, Illinois, for the last time. Info at 3 below. A poem as troublesome as a tree. I could hardly read at all." 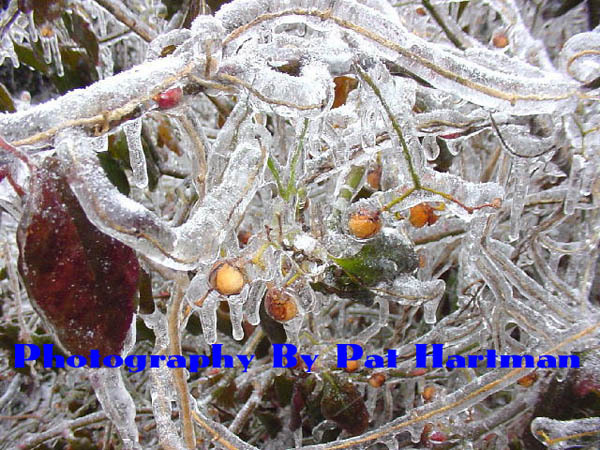 For a link to a site where you can order Pat Hartman's ice storm photos, see Works Cited below. Other photos on this page are by Leigh Henson unless otherwise noted. Of course, this Web page is not related to the history of Lincoln, Illinois, but is being published with a template page from that site and on its server for expediency. In defense of this page: the leisure pace of semi-retirement allows time to document some of life's little plot twists, and the page will help to answer the questions of how did we adjust and what did we do for nearly two weeks when our power was lost. 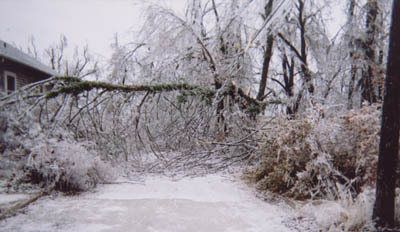 This Web page tells the story of why I could hardly read at all during the great Ozark ice storm of January, 2007. Many of these days were cloudy and afforded poor light for aging eyes, and who wants to read at night with a flashlight? Then there was the continual hassle of arranging for repair of the wires where they attach to the house, trying to get limbs removed from the downed service line and away from the utility pole so that the linemen could repair our severed service line, trying to get a line crew to reconnect the wires at the pole and at the weatherhead, trying to refrigerate food in coolers, just trying to keep warm, preparing meals, and avoiding stir craziness. Actually, the storm did not affect all of the Ozarks. For example, my son, Brandon, lives in Branson, and he said there was no loss of power there. Also, much of Oklahoma that is not in the Ozark region had extensive power outage. The power outage in Springfield lasted 14 days for some people--13 for us. On the first day after the storm, City Utilities reported that 75,000 houses and businesses had lost power. Our phone was also out, so Pat reported it using her cell. Phone service was restored within a couple of days, but we had to use an older, non-electric phone. Several days into the outage, Brandon stopped by to say he had been trying to call us but got no response. He knew we were heating with the stove and oven and was concerned about us. He looked at our phone and pointed out that the ringer was off--an embarrassing oversight for Pat and me, who like to think we know how to handle most basic electronic stuff. This chapter of my autobiography literally did begin on a dark and stormy night--ice stormy, that is--, specifically that night of January 12/13, 2007. 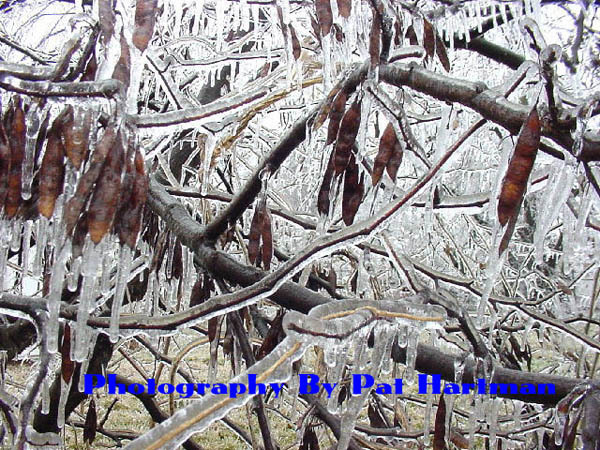 As Leigh and Pat retired on the 12th, we were aware of freezing rain, and I said that there would be trouble with downed tree limbs in the morning, but I did not realize how early in the morning. At 1:00 a.m. on the 13th, we were awakened by the cracking and crashing of large tree limbs around our house in every direction in this heavily wooded old Rountree (not Roundtree) neighborhood of Springfield, Missouri: Queen City of the Ozarks. Using a flashlight to peer through the back bedroom window, I saw that our power line angled toward the ground and that the insulated bolt attaching our power line to the house had been ripped out. I knew that limbs had come down on the line. Our furnace was out. We returned to bed but could not sleep because of the continual (almost continuous), eerie noise of falling limbs. In the morning light we saw the fallen branches in our next-door neighbor's yard that had brought down our electrical service line. Some limbs and utility lines had up to 1.5 inches of ice as reported in the news. In the photo below, the vertical white oval encircles the nearly obscured utility pole that had service lines to four houses: the house at the left of the photo, our house, and two other neighbors' houses. The white horizontal oval marks our line buried under the icy branches. Also, the force had broken the actual power line near the top of the utility pole, although the steel cable which the line wraps around was still attached to the pole and but not to the house: only the actual electrical wire was attached to the house. The white rectangle identifies the service line of our next-door neighbor. That line had a few small branches across it but not enough weight to bring it down. Even lines without damage had gone dead. Our phone line was intact, but the phone was dead. The challenge had begun. After waiting one day for power to be restored, we decided it would be a long wait. I finally found a convenience store that still had some bags of ice, so I bought 5 in order to store frozen food and milk in our camping coolers on the back deck. This food included several bags of frozen crappies (tender, flavorful delicacy that cannot be bought in supermarkets) that we had worked hard for in our excursions to the expansive, 55,000-acre Truman Lake, a two-hour drive north of Springfield. Those fish stayed frozen solid for the duration. We did thaw one bag to fry fish for an evening meal by candlelight. City Utilities was responsible for clearing limbs from service lines, but a day or so after the outage, I became restless and decided to see if I could cut away some of the limbs on the line (I knew it was dead because I could see it severed near the top of the utility pole). I climbed over the fence into the neighbor's yard (she had fled from her cold house). I used a Boy Scout hatchet (although I was never a Boy Scout, only a Cub Scout) to chop branches 2 or 3 inches thick. I cut away all the limbs I could get to: some closer to the utility pole were too high to reach from the ground, but I thought I had done some good. The next day I thought I could do even more, so I got my ladder and leaned it against some of the drooping upper branches to cut loose other branches across the line. That left only a couple of branches on the line high up toward the utility pole: they would have to be cut with a bucket truck. I also used the ladder and hatchet to work on a property line red bud tree whose branches extended over our service line. I managed to chop off some 4- and 5-inch-thick branches. Just trying to save time for the wood cutters who would arrive later--as it turned out, much later. The photo below shows that the insulated bolt (in black oval) had pulled away from the house. The bolt had been screwed into a stud behind the siding. The black rectangle marks the hole where the bolt had pulled from. 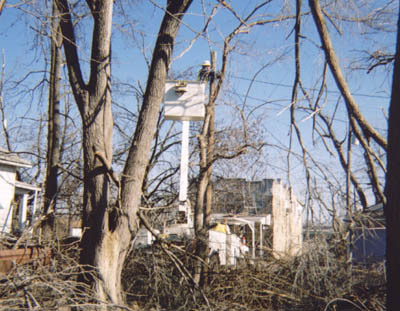 The white rectangle identifies the electric wire entering the galvanized pipe into the house. I later learned that this device is called a weatherhead. The protective cup at the mouth of the pipe had broken. The black arrow at the lower right of the photo points to the meter, which is not in view. After the storm, our main source of news was a local talk-radio station, and we listened to it with a small, battery-powered radio. The morning talk-show host encouraged people to call in if they needed help with one thing or another, and we heard callers expressing various kinds of needs. Many wanted information about buying and using portable generators, and many callers wanted to know where to buy kerosene heaters and fuel. For the first week of the disaster, this talk-show host returned to the air for three hours in the early evening to facilitate people helping one another, and his phone lines were always busy. The talk-show host repeatedly said that he would wait till after power was restored to everyone before he would begin his politicized commentaries, but I heard him at least once "lose it" out of frustration with the slow rate of power restoration. Specifically, he ranted and raved against the city manager and mayor for incompetence. He thought the mayor should have been out in the streets as Rudy Giuliani was after 9-11, and the talk show host repeated the rumor that during the crisis the mayor was staying in a warm motel room in Branson. Listening to this show taught us that damaged weatherheads were not the responsibility of the utility company. In Springfield, the city owns the utility company, appropriately named City Utilities. Late Sunday afternoon (1-14), I used my cell phone to begin calling small electrical companies to find someone to repair our damaged weatherhead. I supposed that owners of small companies would be home on Sunday and I might be able to schedule the work that way. I knew that hundreds or even thousands of people would need that repair, so I did not want to waste time finding an electrician. Many numbers I called were busy, or there was no answer. I finally did arrange for a company to make the repair, but it could not be scheduled till Thursday (1-18). This company agreed to put us on its list but told me to go ahead and see if I could find another source to make the repair sooner and if so then to call back and cancel. 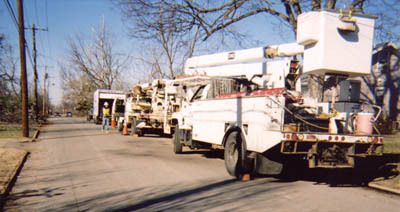 On the morning of Monday, 1-15, I began calling other electrical companies, especially larger ones because I knew they would have more crews to handle such emergencies. In a call to Sechler Electric, the person who answered said she could take my name and number and have the service manager return my call. Since I expected every company was being bombarded with callers needing weatherhead repairs, I expressed my doubt that my call would be returned any time soon. The lady said she thought I would get a call-back that morning, so I left my name and number. Within two hours, much to my surprise, I did get the call. The service manager said he thought one of his electricians could be at our house later that day. I agreed even without discussing price. I was simply glad to have a repair scheduled so soon, and I assumed a well-known, well-established electrical company would not gouge. 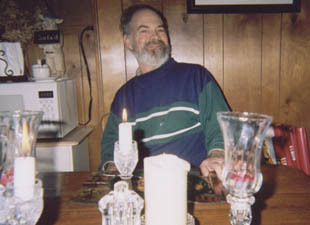 Later I got a call from a Sechler electrician, who said he could come the next day, and he did call me early the next morning, Tuesday, 1-16, for directions to our house. Later on this page I depict and describe the repair to the weatherhead. All of these limbs came from the red maple tree (at the left of this photo). The tree at the right is a white dogwood. 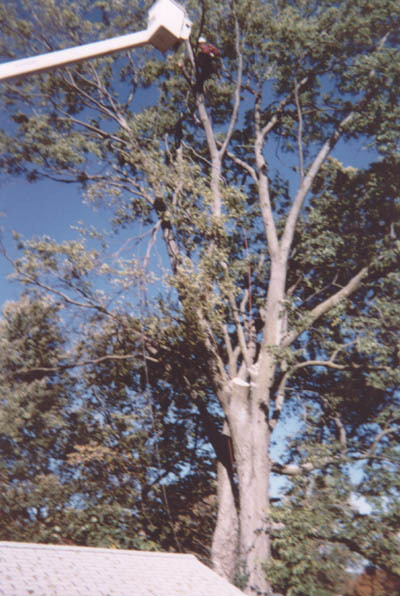 It is a young tree, not more than about 12 feet tall. Its branches bent, but none broke. For several days and nights, I was nervous that a main section of this cherished red maple tree would fall onto our house--right into our great room that housed our four computers, four monitors, scanners, copiers, and printers--eeegads! When I first saw the extent of the damage, I told Pat that we probably would not have power restored for a couple of weeks. In fact, it took 13 days. The damage to our property could have been much worse: the house, my van, Pat's beloved Olds, and the garage were not damaged at all. The greatest potential sources of damage from falling limbs were the large red maple in our front yard and a gigantic property-line hackberry tree in the backyard behind our garage. One limb of about 8-feet from the 60-ft. red maple bounced off the porch roof and landed on the side of my GMC van without damaging anything. When I bought this house in the late fall of 1996, I realized the property had some aged trees and knew they could cause problems. The realtor said the giant hackberry tree was so old (more than a hundred years old) that it had historic status and could not be trimmed or removed without governmental approval. I called in a Missouri Department of Natural Resources arborist who said this hackberry tree had no special historic status that he knew of. With the approval of my neighbor, I then hired a tree company to remove two large limbs of the towering hackberry that extended over my garage. These limbs were so large (12- to 15 inches thick) and heavy that they could have collapsed the garage if they had fallen in that direction. I was concerned about both the garage and my then-25-year-old antique Mark Twain runabout boat parked there. This work was accomplished not with the use of a bucket truck but by two young men who climbed high into the tree. They wore safety harnesses and looped safety ropes through forks even higher than they were going to work. On the majestic red maple, the tree experts installed a pin and cable to support the main fork. Then for several years I did not worry about the giant hackberry tree or the red maple, but in January of 2006 I began to think about the hackberry again. At that time one morning early, Pat and I were working at our computers when we heard a very loud cracking and crashing sound. We looked out the windows to see that one of the three, gigantic "sucker" trunks of the old hackberry had fallen into our next-door neighbor's yard. 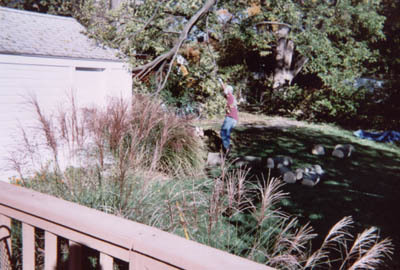 Some of the extended, small branches damaged the edge of the roof of the house; other outer branches landed on the old, single-stall garage (photo below). Its roof was smashed, and the entire structure leaned enough to suggest it could collapse. I thought the building would have to be demolished, but later, after the fallen trunk and braches were removed, some carpenters came in with cables and "righted" the garage, tore off much of the damaged sideboard, and replaced it with metal siding. In the summer of 2006, after the hackberry trunk had fallen, we decided to remove a couple of large limbs from the hackberry to lighten the load and stress on one major fork. This was a preventive measure. I had learned that tight forks are sometimes weak and that those of hackberry trees are especially weak. Again, I was trying to avoid large limbs from coming down on the garage and boat. If possible, I wanted to use Noel Boyer, the master tree-climber-cutter of the tree company I had previously hired. Using the Internet, I discovered he had left that company to form his own: A&A Tree Service. When I told Noel what I wanted to do, he agreed; and he was hired. In the large photo below at the left, Noel is in the bucket. He had just bought the bucket truck prior to this job (he had to travel to Clinton, Illinois, to get the truck). The bucket truck saved him from having to climb, but the job did require one climber (seen next to the bucket). Noel told me this worker is a spry, forty-two-year-old, dedicated tree climber. 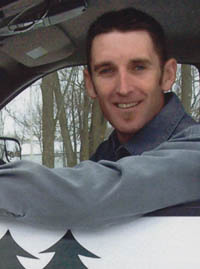 Noel is a certified arborist and Midwest tree climbing champion of 1998, 2002, 2003, and 2004. Also, he earned a bachelor's in psychology from Missouri State University. I forgot to ask him if he offers psychotherapy to trees whose limbs he amputates. A link to the A&A Web site appears at the bottom of this page. Taken from the same perspective as photo 7 above, the photo below shows the crown of the giant hackberry tree after the ice storm. The arrow points to a cable installed by Noel last summer to help secure two large limbs. The ice storm felled only a couple of branches from this tree, and they dropped into the yard, not onto our garage. 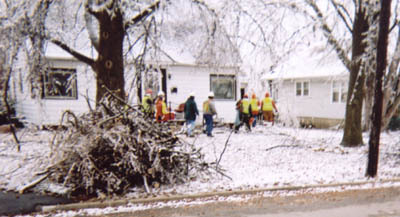 The next two photos show work on the oversized hackberry tree in the summer of 2006. 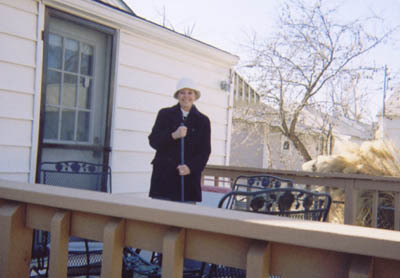 The background of the above photo shows a neighbor's garage just above the cutter's head. 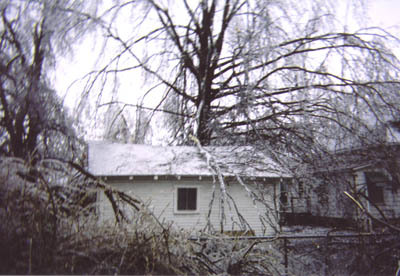 The photo below shows a view of the same garage after the great Ozark ice storm of January, 2007. The limb of the pin oak tree across the garage roof apparently did no serious damage. Pin oak trees grow to enormous size in this part of the country, and many of them lost large branches in the storm. About 8:00 a.m. on Tuesday, January 16, two electricians arrived to repair the damaged weatherhead. The repair included rewiring from the outside to the meter (photo below). The electricians said the repair was not difficult, but they spent much of the morning on this job, and the bill was $625.41. At least that was less than the $800.00 that would have been charged by the other company with whom I had first scheduled the work to be done on Thursday. When I got the bill, I called our insurance agent's office. Our policy has a $500 deductible, so I thought I would inquire about a claim for the insurance company to pay the remaining $125.41. The agent's secretary right away said the claim would be on our record for 3 years. The first thing that went through my mind is that this response suggested the possibility of a rate increase (or, as Pat suggested, worse--cancellation), so I decided not to file a claim. A day or two later on talk radio, there was discussion to the effect that even a phone call to an insurance agent will be placed on the insured's record and treated like a claim. That is something I will ask our insurance agent about in the near future. 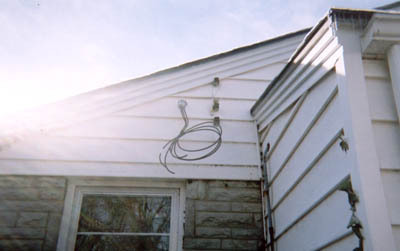 The above photo does not clearly show the little wire harness used to connect the metal cable, which the service power line wraps around, to the insulator bolt screwed into the stud behind the house siding. This wire harness has been fastened to the top insulator bolt, waiting for the lineman to connect it to the steel power-line cable. 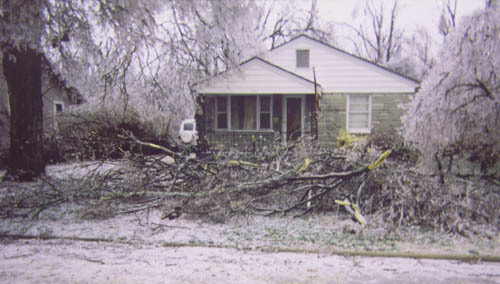 Before the power line tore from the house, it was connected to the middle insulator bolt. The electrician who repaired the weatherhead screwed the middle insulator bolt back into the hole from which the bolt had ripped out. I was concerned that perhaps a lineman would again use the middle insulator bolt to connect the power-line cable to the house, and if that were the case, the middle bolt would not have held since it was screwed into a reamed-out hole in the stud. Thus, I got my ladder and went to work. I removed the middle insulator bolt and screwed it into a new position below the old hole. After the weatherhead was repaired, we experienced an uncertain, prolonged length of time as we waited to be reconnected. The power line would have to be reconnected at both the house and the utility pole, where the line had broken, before the line could be "energized." We notified City Utilities that the weatherhead had been repaired. Talk-show radio said the electrical company making the repair was obligated to notify city Utilities and that each electrical contractor had a secret CU number to use for this purpose. When I called CU again, the one who answered said either the customer or the electrical contractor could notify. Each day we hoped would be the magic time for reconnection, but we had to endure 9 more days after the weatherhead repair before the reconnection would be made. Talk-show radio told us that there was no relationship between time getting a weatherhead repaired and time getting power restored. Curiously, twice during this time CU called to ask if our line had been reconnected. CU had to ask us? Very puzzling. During this time we adjusted. Pat needed to take her eBay listings offline, and managed to do so with the good help of my stepmother, Judy Henson, in Lincoln. 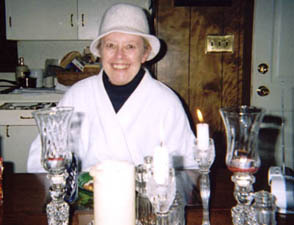 Pat used computers at a branch of the public library to access email and keep up communication with customers. Pat also visited a neighborhood laundry a couple of times. Supermarkets remained open and well stocked. Thanks to Pat's thoughtfulness, a couple of times we watched DVDs on her battery-powered lap top. 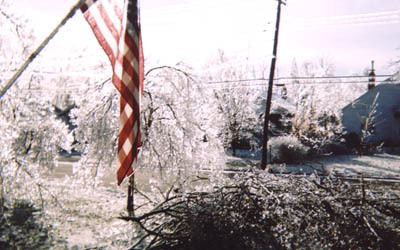 The comparisons between this ice storm and Katrina made by some callers on talk radio were silly. Fortunately we have a gas kitchen stove. Each morning we lighted the four burners and oven. The day temperature stayed between 60 and 65 degrees. Our carbon monoxide detector never sounded an alarm during this time. At night when we turned off the stove and oven, the temperature ranged between the upper 40s and mid 50s, depending on the outside night temperatures, which ranged between the upper teens up to 50 degrees one day. For the first time in my 64+ years, I began to go to bed early and wear a Bass Pro stocking cap to keep my head warm. Also, our hot water heater worked, and that really helped. 16: One Face of (Unintended) Adversity? More than once things happened that gave us false hope of having power restored. One of these events happened near the end of the first week without power when several orange Asplundh trucks appeared in the street in front of our house. 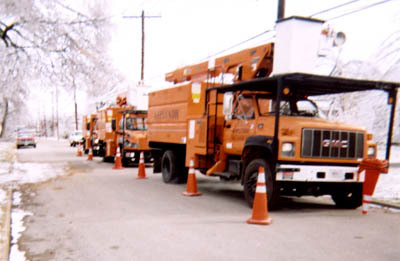 These were the trucks of wood cutters, and we knew that wood-cutting crews would be working to clear downed lines of limbs so that linemen could then do the work of reconnecting. Typically, the line crews appeared the day or two after the wood cutters. The trucks in the photo below were parked on the street in front of our house. The photo below shows woodcutters moving toward the service lines connecting from the backs of houses to the lateral lines and poles located in the backs of yards. These service lines and lateral lines were sometimes located at the backs of lots that had no alleys. These yards are often separated by privacy fences, so the crews had to walk between houses to access these lines. These conditions slowed the work. Throughout the power outage, I continued my afternoon walks and jogs throughout the Rountree neighborhood. It is a very well-defined neighborhood in central city just east of the Missouri State University campus, bounded on the west by National Avenue, the east by Glenstone Avenue, the south by Grand Street, and the north by Cherry Street. From west to east, it is about 10 blocks and from north to south, about 7 blocks. During my walks I sometimes spoke to City Utilities' supervisors in their white pickups as these men were directing the wood cutting crews. Most of these supervisors were not very communicative. When I approached one in his white pickup truck, he was talking on his cell phone with the window down. I could tell he was visiting with his significant other and was in no hurry to finish that conversation in order to talk to me. I heard him brag that he had met the president of a large, well-known electrical wholesale company that morning. When he did finish his call, he assured me that he had no clue when reconnecting would begin. He admitted that this was not his usual kind of work: he said rather pretentiously that his regular work was in "high voltage." (Did the power outage force him to go slumming in neighborhoods with linemen?) I did manage to get another supervisor to admit that most likely no reconnections would be made in the neighborhood for another 5 to 7 days--very disheartening news after already being without power for a week. On Tuesday, January 23, we decided to treat ourselves to dinner at our favorite (authentic!) Mexican restaurant: Portales. It is a curious place because the building it is in was originally an oriental restaurant, and there are still some traces of oriental decor in the building's architecture and large sign out front. The oriental restaurant was allegedly where cashew chicken was invented. When we returned home, it was night and quite dark, of course, without streetlights. We were amazed to see orange Asplundh trucks with men in buckets cutting limbs away from the power lines in front of our house. This was a weird sight: there were countless bright lights on the trucks and roving spotlights on the power lines, trees, and men as they cut with electric saws powered from the trucks' engines. We were excited at this apparent progress, although our service line connects to a pole at the back of a neighbor's lot, not from the lines across the street in front of our house. While I stood outside to watch the night tree-trimming crews, I stopped a City Utilities truck. I was pleased that the two men listened to me as I described the hidden location of the utility pole where our service line was broken. This utility pole sits back from the street about 30 feet inside an unused alley and was nearly obscured by the scrub trees around it. I told the men I had taped a sign on the utility pole to let linemen know we had our weatherhead repaired and were qualified to be reconnected. These men got out a map and tried to pinpoint the location of the pole, but they told me that trimming in that alley would not be done that night. I thought I had wasted my time in talking to them, but I was wrong. The next morning one of these supervisors returned with two trucks and four wood trimmers (one crew would have been enough). While this crew worked, I watched from behind the truck. As the work was being finished, the City Utilities supervisor I had told about this pole the night before drove up. I walked over to thank him for bringing "these good men" to do the work. By then the man in the bucket had descended and was standing nearby. When he heard my compliment, he came over to shake my hand. The CU supervisor said these men were "his finest." 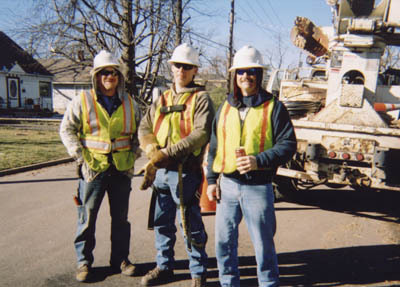 I knew that many crews had been brought in from out of state and that these workers appeared to have southern accents. The CU supervisor said these men were "ragin' Cajuns" from Louisiana. When I thanked the CU supervisor, I asked for his name so that I could write a complimentary letter to CU. Either because of policy or because of modesty, he would not give his name. The wood cutters and I laughed when I said I really didn't need his name to write the letter because I had his truck number: 825. Note the two-story native fieldstone building in the background of the photo above. I speculate that this building used to house a neighborhood grocery; now it's the home of Missouri Rug Cleaners. Although City Utilities gave priority to restoring power to businesses, this business was not one of the lucky ones and operated its own generator until power was restored on January 25th. How many "ragin' Cajuns" does it take to trim a red bud tree? They took turns using the long saw in order to avoid overexertion. 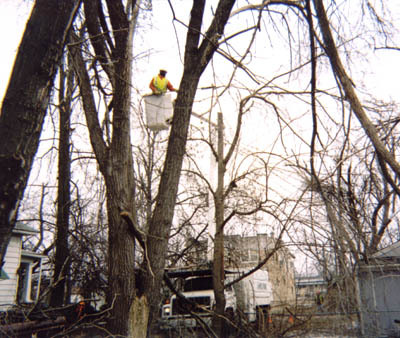 Actually, I had already cut down the main branches overhanging the area of the service line. I pointed out the fresh cuts on the upper branches (circled white in the photo) and explained that I got to those limbs with a ladder and chopped them down with a Boy Scout hatchet. These Cajuns just looked at each other and smiled faintly. I'm not sure what they were thinking, but probably that I must have fallen and hit my head. We learned that linemen were assigned to certain regions in the neighborhood and that they could not work outside those areas, no matter what. Our service line connected to a utility pole in the alley behind our neighbor's house, but the linemen whose trucks were parked on the street in front of our house were not assigned to the region where "our" utility pole was located--a cruel irony for us. From observations during my walks and from driving the neighborhood, I concluded that the linemen who would reconnect us would be coming from the far west side of the Rountree neighborhood. They made slow progress as they advanced eastward, working extensively in alleys and side streets, including some dead-end streets. On the morning of Thursday, January 25, I was excited to see a single white lineman's truck and crew had advanced to the street on the opposite side of our block. I speculated that this crew would follow the woodcutters who had worked that street the day before and who had then turned the corner to work the street crossing the alley where "our" utility pole was located: that was the pattern described by CU press releases as reported on talk radio. I talked to the chief of this line crew and explained the obscure location of this utility pole that had four service lines, including ours that needed to be reconnected at the pole and weatherhead. He seemed to appreciate my "heads-up." In about an hour this crew had turned the corner and backed its truck into the alley toward "our" utility pole. I stood across the street in front of the Missouri Rug Cleaners to watch, eagerly anticipating this apparent progress. 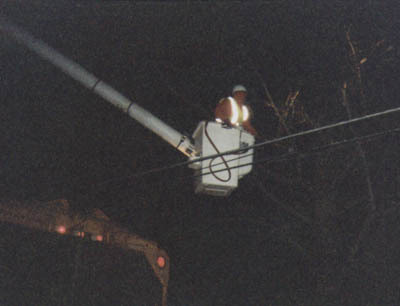 A lineman climbed into the truck's bucket, preparing to work on the service lines. A CU pickup truck arrived and parked nearby. Its driver was a supervisor who spoke to the line crew chief. A few minutes later the crew chief walked toward the bucket truck and spoke to the lineman preparing to raise the bucket. The crew chief saw me and walked over to tell me the CU supervisor was pulling his crew out, although there certainly was work to be done there. I walked over to talk to the CU supervisor to ask why he had pulled the crew from a location where several service lines needed reconnecting. As I approached him, he was finishing a cell phone call. I confessed that my "heads-up" to the line crew chief led him to go to this location, explaining my assumption that this line crew would follow the same route as the woodcutters the day before--a workflow pattern announced by his company. The supervisor said the utility pole was just outside of his region, so he had to pull this crew away. This supervisor admitted that the location needed much work but was the responsibility of another supervisor whose regular work was in "water" and who did not really know what he was doing in this situation. The CU supervisor told me that he was regularly a line supervisor and knew exactly what he was doing. He said the call he just finished was to another line crew assigned to the region where "our" utility pole was located and that line crew would arrive later. I thought, "Yeah, sure--, much later." Just after lunch that day, I was amazed to see that a bucket truck had backed up to the most important utility pole in Springfield, MO. 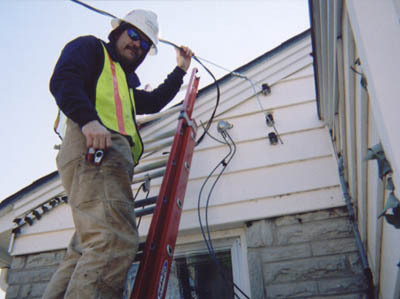 Dave Nagy was a helpful, friendly lineman. He was willing to explain the things he had to do, including testing the meter to be sure it had been correctly wired. He said if it were not and power came on, it could burn down the house. Dave said he was brought in from the Detroit area. He said his wife wanted him home ASAP. She was getting tired of keeping wood in their outdoor furnace used for the water-heated system in their house. I told Dave he was welcome to take back any wood from our backyard. He declined the offer but said he had seen some flat, dark limestone at various sites that he would like to take back to use in making an outdoor barbecue pit. I mentioned that those stones were getting very hard to find, are expensive, and now mostly came from Arkansas. I should have told Dave that the gray Carthage stone which our house is built from is even more at a premium because it is no longer quarried. One of my colleagues tells me I should worry every time we leave town because then she would have the opportunity to steal the coveted Carthage stone. As I said goodbye to the linemen, the CU supervisor in truck 825 drove by, and we gave each other a thumbs-up. As it turned out, we were among the last 5,900 to have power restored (Thursday, January 25). That is, 92% of those who lost power had it restored before we did. The main reason is that the utility company concentrated wood-cutting and linemen crews in areas where the largest number of people and businesses could be restored in a given work period. Rountree neighborhood was not one of them. City Utilities reports that its storm-damage expenses will be from 12 million to 15 millions dollars. 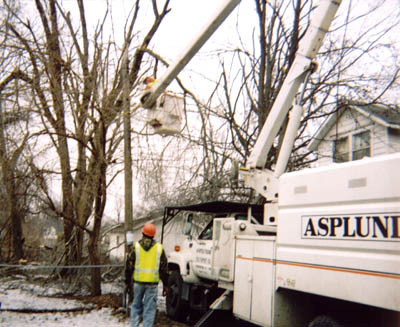 From what I see, there are thousands of broken, hanging branches that remain in the trees of Springfield, Missouri--a continuing concern for City Utilities, homeowners, and businesses but a boon to tree service companies for many weeks ahead. I'm sure the "rough winds" of spring and early summer will bring many down. An afterward: two days after our power was restored, we heard what sounded like our smoke alarm. It turned out to be our carbon monoxide detector. It was merely letting us know the battery was getting low. But imagine what our reaction would have been if the alarm had sounded while we were using the stove to heat the house!